secondary ones ('Handle A' , 'Handle B') that can be used to drive any attribute from the 'Base' Noise. 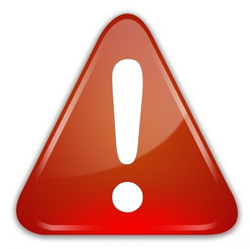 Please note samples were created with an older version of multi FBM. Some small UI & behavior changes exist in current versions. The two colors that make up the final look of the procedural. running it multiple times incrementing the values from loop to loop. By default the Base Group's Octaves Attribute is mapped with the Output of Group 'Handle A' so changing the slider won't do anything unless the mapping is changed in the dropdown HandleA. Controls the size of the secondary fine details. with very few large features. A random start value for your fractal. Changing the seed changes the overall look of your fractal while the general feature look stays the same, allowing for quick variation with a general look theme. The amount to multiply the noise's amplitude by, contrasting the noise..
A Gain of 0.0 will result in the value defined under Baseline. or white (incoming values to the right of the set slider value). will be black and incoming values higher than 0.6 will be white. Between 0.4 and 0.6 will be a soft gradient. 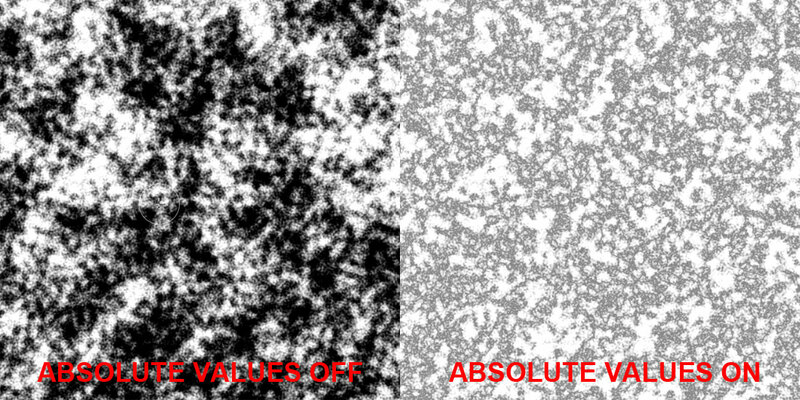 When generating a Noise, values are often generated from -1.0 to 1.0. Absolute Values will convert any negative Value to a positive one giving more 'solid' noise results. Clamps the noise calculation to a 0-1 range. reliably. In general this should be left on. Inverts the result of the noise. Inversion is done before color A and B are applied. 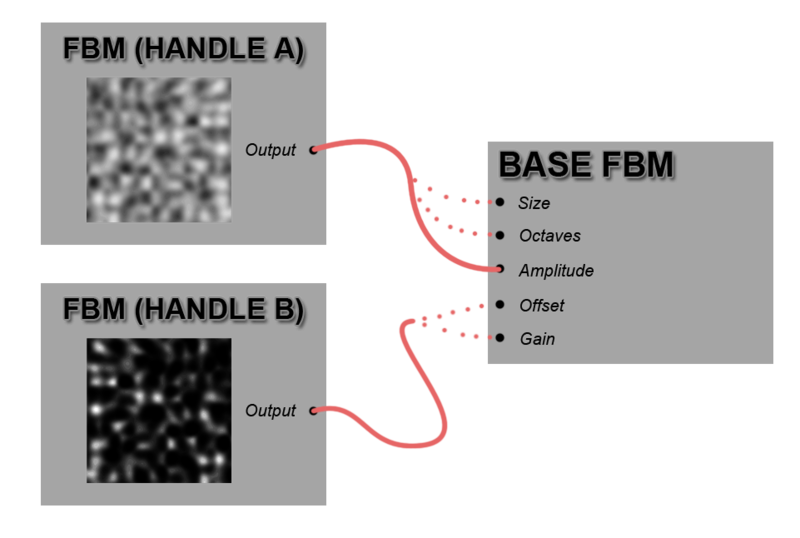 Handle A or B represent a second and third FBM Noise that can be mapped to drive any attribute of Group 'Base'. Output Values are defined by the NewMin / NewMax Attributes within each Handle Group. Will show you just the resulting Noise that 'Handle A' (or B) is outputting making it easier to isolate its contributions to the final look. New Min / New Max Attributes from 'Handle' Group are ignored for this preview. The Handle Dropdown Menu will allow you to set which Attribute from the Group 'Base' the Noise created by 'Handle A' (or B) should drive. By default HandleA it is set to modify the 'Octaves' of the Group 'Base'. 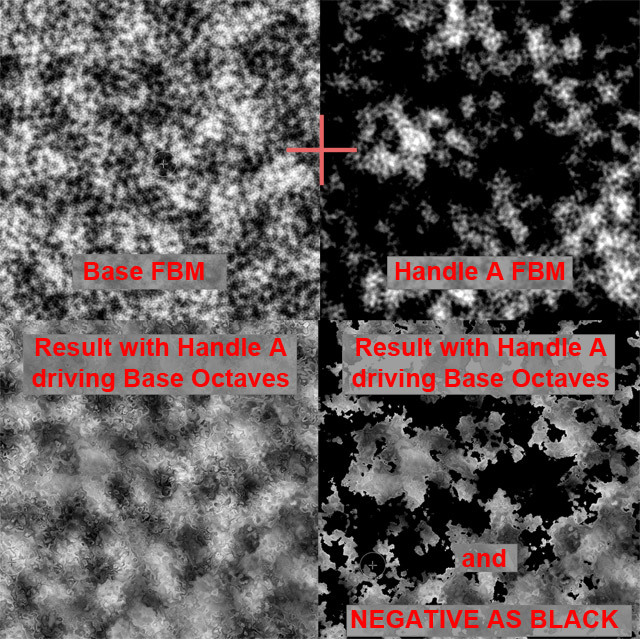 Size of fractal features on your model for Noise created by Handle A or B. 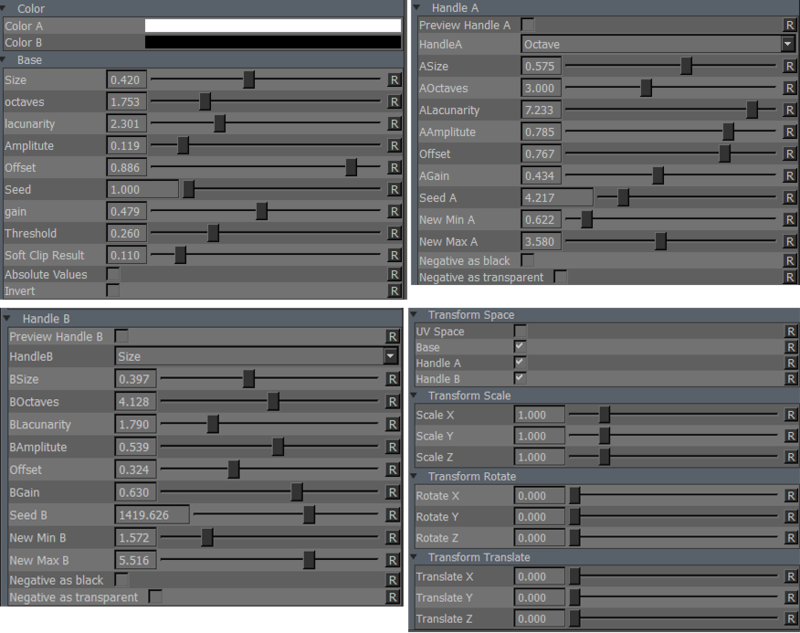 Controls the size of the secondary fine details of the noise created by Handle A or B.
Amplitude affects the length and amount of fine detail the Lacunarity is contributing to the base pattern of Noise created by Handle A or B.
allowing for quick variation with a general look theme. By default the values coming out of a noise are ranged from values 0.0 to 1.0. To accurately map another noise's attributes we need the ability to remap the noise. FBM Noise sliders support 1 to 8 octaves. Mapping another noise to drive the octaves would give us a maximum of 1 octave because the input noise values can't go over 1.0. With the help of the NewMin and NewMax Attributes we can set a new range for the noise. NewMin represents the minimum value each noise should ouput, NewMax the maximum value. the input noise and givie it a flat constant value. Represents the minimum value the noise from the current Handle should output to the mapped Attribute from group 'Base'. octaves the base noise should have. that are in a negative value range in the Noise output by the Handle group. By default this procedural is generated in 3D World Space. This results in a seamless noise across UV seams. 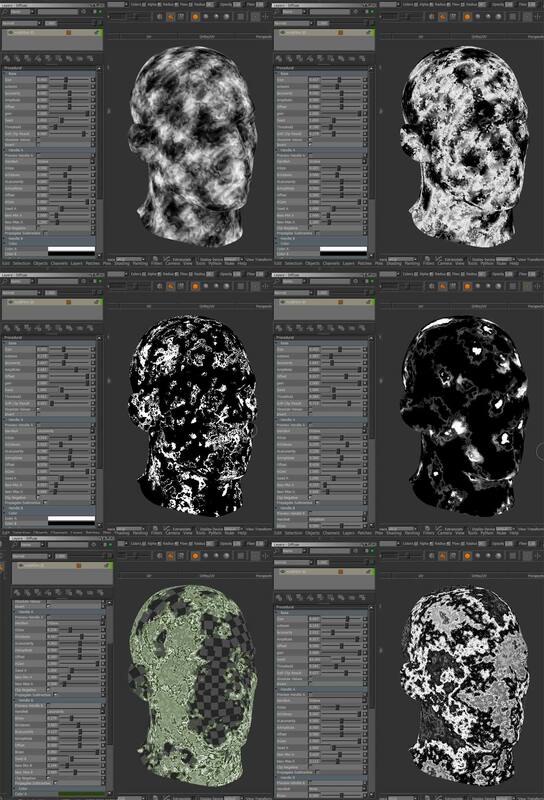 By turning on UV Space the procedural is generated based on your UVs, resulting in seams between UV tiles/UDIM & uv shells. Will apply a scale along X,Y or Z to your noise. This is useful for creating patterns like woodgrain, drips etc. When UV Space is turned on Scale Z is ignored. and rotation is done around the center of each UV Tile/UDIM using Rotate Z. Will apply an offset in X,Y or Z to your noise. When UV Space is turned on Translate Z is ignored.